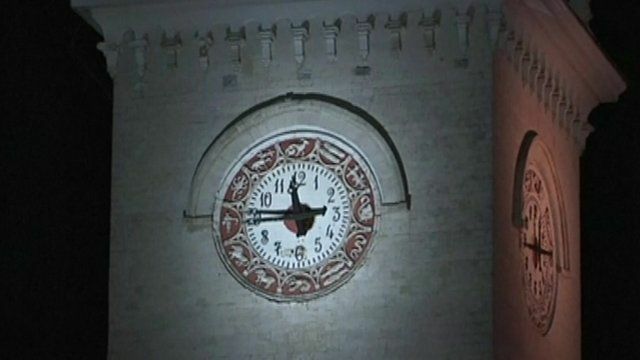 Crimea celebrates clock change Jump to media player People in the Crimean capital Simferopol have been celebrating the change of the clocks to synchronise with the time in Moscow. New push for Ukraine crisis solution Jump to media player Russia has said it has no intention of invading mainland Ukraine, following its seizure of Crimea. Russia 'won't cross Ukraine borders' Jump to media player Moscow has "absolutely no intention" of sending troops into Ukraine, Russian Foreign Minister Sergei Lavrov says. Waiting for Putin's next move Jump to media player Following Russia's annexation of the Crimea, the West is trying to work out what the Kremlin's next move will be as Steve Rosenberg reports. UN declares Crimea vote illegal Jump to media player The UN General Assembly has approved a resolution describing the Moscow-backed referendum that led to Russia's annexation of Crimea as illegal. Do Crimea referendum figures add up? Jump to media player The BBC's Ben Brown in Simferopol says a "huge number of people in the minority populations - the Tatars and Ukrainians" abstained from Sunday's Crimea referendum. Crimea 'votes for Russian union' Jump to media player Some 95.5% of voters in Crimea have supported joining Russia in a disputed referendum, officials announce, after half the votes have been counted. People in the Crimean capital Simferopol have been celebrating the clocks changing to synchronise with the time in Moscow. Moscow formally annexed Crimea earlier in March after the predominantly ethnically Russian region held a referendum which backed joining Russia.